My colleague Michael Ashby has kindly sent me some press cuttings he found while going through a collection of old IPA archive material at UCL. Here’s a fragment of one of the cuttings, dated 1919, which contains what Michael characterizes as “a wonderfully fanciful conception of what a kymograph could do”. I’m sure we’ve all come across journalists who don’t get things quite right, but this sounds as if Daniel Jones himself must have been either exaggerating or else not explaining things at all clearly. 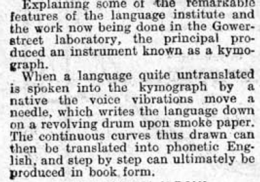 The kymograph, a mechanical rather than an electrical device, did produce a waveform of sorts and “was capable of registering details of articulation and phonation such as changes in nasal and oral airflow” [Collins & Mees, The Real Professor Higgins, p. 246]. But using it to translate “a language quite untranslated” into “phonetic English”? Please. The article ends with some remarkable news. Eat your heart out, SIL! Meanwhile I’m doing a kymograph-based reconstruction of - er - Anglo-Saxon? p-Celtic British? the Latin spoken in Londinium and Aquae Sulis? One of them, I’m sure. Some time ago Jérôme Poirrier asked me how I would pronounce the last word in each of the following sentences. I wouldn't say he was careful - in fact, I would say he was careless. I didn't say she was interesting, I said she was interested. The speaker is faced with conflicting rules here. On the one hand, when contrasting two words or phrases like this we normally use a contrastive accent, placing it on the item under focus. I 'wouldn’t say he was \/careful, | in 'fact I’d say he was \negligent. I 'didn’t say she was \/interesting, | I said she was \boring. I 'wouldn’t say he was \/careful, | in 'fact I’d say he was \careless. I 'didn’t say she was \/interesting, | I said she was \interested. The first way avoids the problem by changing the wording so that it is words, rather than just morphemes, that are under contrastive focus. The second is not impossible, but feels awkward because the accent is on syllables other than the ones being contrasted. So can we override the second principle in the interests of the first? Speakers certainly sometimes do. I 'wouldn’t say he was \/careful, | in 'fact I’d say he was 'care\less. I 'didn’t say she was \/interesting, | I said she was 'interest\ed. You can even do that on the first half of each contrast as well as the second. I 'wouldn’t say he was 'care\/ful, | in 'fact I’d say he was 'care\less. I didn’t say she was 'interest\/ing, | I said she was 'interest\ed. Hello! I am a chinese student. I have a question. If the teacher speak the wrong pronunciation, what should I do? Such as: "Usually" There is /3/,the phonetic symbol, Teacher speaks different of the dictionary. Thank you for your dictionary, it gives me a great many helps. As you can see, this student’s command of English is not perfect. There are errors of subject-verb agreement (the teacher speak), countability (a great many helps), and collocation (speak pronunciation, different of). Nevertheless, the meaning is clear (I think). The student claims that his teacher has wrongly stated that there is pronounced ðɜː, which is not what his dictionary shows. That's not a question of phonetics, but of polite behaviour. Speak privately to your teacher. I would not encourage a student to disrespect his teacher, and certainly not in front of the whole class, though there is nothing wrong with a student doing his own investigation to check whether the teacher’s claims are correct. Indeed, in British universities we often complain about the tendency of East Asian students to accept everything their teacher says without testing it. If this student had written to me in perfect English I might have replied differently. In any case, the teacher may not be exactly mistaken. (i) Perhaps the teacher correctly taught the students the weak form of there, which for many speakers (including me) is ðə; but this student misinterpreted this as ðɜː, and thought it was the strong form. (ii) Perhaps the teacher is a native speaker from Liverpool or somewhere else where the SQUARE and NURSE vowels are merged, or a non-native speaker who studied in Liverpool or was taught by a Liverpudlian. There must be a million NSs who say things like Sit down th[ɜː]. In any case, mispronouncing there as ðɜː (if that’s what it was) is pretty low in the hierarchy of possible errors: lower than the grammatical and other errors in the student’s email. It would not lead to any misunderstandings. To me at least it would be nowhere near as annoying as the grammatical errors. Maybe your correspondent, the Chinese student, actually meant that his teacher did not pronounce the word "usually" correctly. This would be my spontaneous interpretation of his message ( could mean [ʒ]), and it corresponds to my personal observation that many Chinese learners of English tend to replace [ʒ]] with something like [ɹ]] in words like "usually". Having studied and worked in Beijing for about seven years, I wouldn't even advise the student to speak to his teacher in private, unless the student's relationship with that teacher is closer than usual. I'd rather recommend some way to practice the correct pronunciation on his own and to listen to as much authentic material as possible. Despite the fact that, like many native speakers, I pronounce clothes as kləʊðz, with that tricky final cluster ðz, I am aware that many other native speakers say kləʊz. And I can understand why there are EFL speakers who might well prefer the simpler form. Anyhow, here’s a nice photo from engrishfunny.com which shows that somewhere (where?) there’s at least one person who gets the spellings confused. It must be someone for whom clothes and close (verb) are homophones, and who is not sensitive to the participial ending in closed. An item in yesterday morning’s BBC news concerned a child mauled to death by a dog. 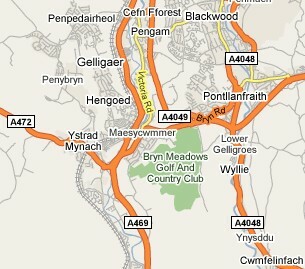 The tragedy took place in Ystrad Mynach, near Caerphilly in South Wales. The announcers on Radio Four were entirely unfazed by this name, despite its extremely non-English appearance. They pronounced it correctly as ˌʌstrəd ˈmʌnəx. Phonetically, the name is an interesting mixture of English and Welsh. In standard Welsh it would be ˌəstrad ˈmənax, with strong vowels in the final syllable of each word. In Welsh, vowels do not get weakened as in English, and in particular you never get schwa in the final syllable of a content word. You do, however, frequently get schwa in stressed syllables. So the anglicization involves the weakening of the final vowels, as well as the usual mapping of stressed schwa onto the STRUT vowel (which in south Wales English is pretty schwa-like anyhow). But it does not extend to the replacement of x by an English consonant. Outsiders, though, would surely change x to k. And outsiders wouldn’t know how to treat the Welsh spelling y (which in proclitics and non-final syllables stands for schwa). They would probably say something like ˌɪstrəd ˈmɪnək. So due credit to the BBC announcers for getting it right. Ystrad, by the way, is the Welsh equivalent of the Gaelic srath that we know from Scottish place names such as Strathclyde (Srath Chluaidh, Welsh Ystrad Clud). 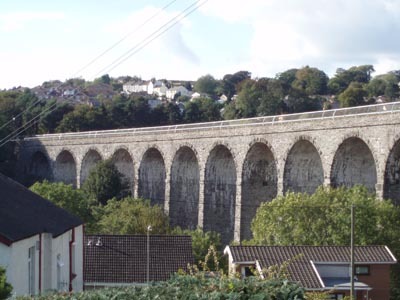 Mynach means ‘monk’ (< Latin monachus): so on the face of it the whole name means Monk’s Vale. According to Wikipedia, though, this is a popular etymology rather than a true one. I’m not sure what to make of this. It’s an interactive web page called Sammy. Here’s a screenshot, half-size. 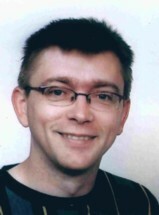 It is entitled Interactive Sagittal Section, and is the work of Daniel Hall of the University of Toronto. It “displays mid-sagittal sections and IPA transcriptions for user-specified articulations”. You, the user, click radio buttons to specify voicing, nasality, lip position, place of articulation, and manner of articulation. The schematic sagittal section changes shape accordingly, and the appropriate IPA symbol appears in the box. But there’s no sound. Try it out. 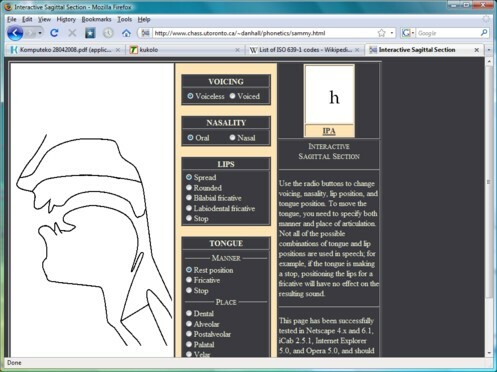 It could be useful in teaching articulatory phonetics. You could set it to show β͡ʁ, a bilabial-uvular voiced fricative. And all sorts of other fun things. Yet another tricky ch word (3 Feb., 23 Jan.) is conch. As I’m sure you know, a conch is a mollusc, a kind of large saltwater snail and its shell. Not only is it edible, its shell can be used as a sort of trumpet (as blown by Tritons). In Golding’s Lord of the Flies a conch shell is used to call the boys together and at meetings is held by whoever is speaking, as a symbol of democracy and order. However, some people pronounce the word kɒn(t)ʃ, which presumably originated as a spelling pronunciation (though the OED thinks it may be the earlier form, having come in via French). In words with final ch there is an interesting interaction between pronunciation and spelling. If the sound is tʃ, we form the plural by adding -es, as in churches, touches, inches. But if it is k we add just -s, as in distychs, monarchs, epochs, matriarchs. So those of us who say kɒŋk, kɒŋks logically spell the plural conchs. Those who say kɒn(t)ʃ, ˈkɒn(t)ʃɪz spell it conches. West Indians, for many of whom conch is an everyday word, pronounce it with final k (though in some islands the conch is known instead by the alternative name lambie). On this Caribbean recipe page (scroll a long way down) there is a recipe for CURRIED LAMBIE/CONCHS. The spelling tells you how the author of the recipe pronounces the name of the main ingredient. whether the elision of /d/ commonly takes place not only in /-ndC(-)/ as in "kindness" but also in /-ldC(-)/ as in "fieldstone" and whether they are the only context in which /d/ may be commonly elided within words in isolation. the elision of /d/ as in "finds, hands, lends" (and "builds, fields, holds") is less common than that of "friendship, kindness, landscape" (and "fieldfare, fieldpiece, fieldstone"). Most of the dictionaries, both EFL dictionaries and pronunciation dictionaries, show the elision of /d/ as in "friendship, kindness, landscape" but not that of "finds, hands, lends" or "builds, fields, holds". I thought this was systematic difference in frequency of occurrence of the elision. If not, I wonder why they only show the elision in the "friendship, kindness, landscape" type. Jack was quicker off the blocks than me, and you can read his reply here. Susan Ramsaran’s PhD thesis (1978) was an investigation of assimilation and elision in recorded spontaneous RP, but it has never been published and I do not have access to it. Nor can I remember what she found about elision of /d/. So all I can do is give an introspective subjective account. Here is what I think. Briefly, I find elision of /d/ after /l/ much less comfortable than after /n/. Although I would readily elide the /d/ in kindness, I would not elide it in boldness. I can lose the voiced plosive in windmill, but not that in field-test. For some reason I feel happier with elision in words beginning gold-: goldmine, goldfield. Even there, though, it’s not nearly as easy as in windmill. I am not very happy with eliding /d/ in hands, finds, grounds, although I suppose it might be possible in casual speech. But eliding /d/ in fields, builds, folds feels impossible. Furthermore, I am reluctant to say that elision is possible in kindly (which means that following /l/ seems to be a disfavouring factor, too), and I feel it to be impossible in boldly. My gut feeling, therefore, is that /-nd#C-/ is the only environment in which I would readily elide /d/ within a word. And this applies only in compound words, as indicated by the symbol # in the formula. And there are restrictions on what the C can be. Before a syllabic lateral, as in handle, elision is impossible: this word can never rhyme with channel. In a phrase such as old man I think I would normally assimilate the /d/ to [b] rather than elide it (delete it). In LPD, as far as this sort of thing goes, I was essentially reporting my own native-speaker feeling, word by word. It is only now, facing Kensuke’s question, that I realize that I consider elision of /d/ to be comfortable only after /n/ (not /l/) and only before another morpheme beginning with a consonant (not an inflectional ending -s). It looks as if other lexicographers feel the same way. Who’s going to collect some authentic speech data? Throughout, he called it ˈlɪtʃtənstaɪn. Perhaps I ought to refer him to the BBC Pronunciation Unit, whose recommendation, as shown in OBGP, is “likh-tuhn-shtyn ˈlɪçtənˌshtʌɪn” [sic], “sometimes anglicized to lik-tuhn-styn”. In German it is pronounced ˈlɪçtn̩ʃta͜in (according to the Duden Aussprachewörterbuch, at least) . As you can see, this name does violate the usual German spelling-to-sound rules, but only in the matter of the first vowel, written ie but pronounced short rather than as the usual long iː. The sound corresponding to the spelling ch is ç, the expected value for German ch after a front vowel. In LPD I give the anglicization ˈlɪktənstaɪn with an alternative, half-way anglicized, ˈlɪx-. I hope others agree with me that the velar x is not uncommon as a semi-anglicization of the German palatal ç. Another example is the word echt ‘pukka’, German ɛçt, which I at any rate pronounce ext when I’m speaking English. When speaking German, of course, I pronounce it properly, using die echte Aussprache. And in neither language would I pronounce Liechtenstein ˈlɪtʃ-. Intonation accents can normally be located only on lexically stressed syllables. So what do we do if we want to throw into contrast two words where the difference is in the weak syllables? I’m not aware of anyone who has really looked into this. And I think real life (or a spoken corpus) might throw up different answers from those we get by introspection. What I would expect to happen is either that we would abandon any attempt to use contrastive accentuation in such cases, or that the weak vowel, now accented, would be replaced by the corresponding strong vowel, based either on morphologically related forms or on the spelling. — i.e. the weakened vowel quality was retained even though it is now accented. We have something similar in the frequent accented form ˈdʒəst of the adverb just, or ˈsətəv for sort of. I have also heard ˈɪndiə ən ði ɪndiˈənz India and the Indians. In my intonation book, p. 187, I gave two examples of accented weak syllables, both overheard in real life. I did characterize them as “even less typical examples”. But I didn’t discuss the segmental phonetics. The IPA website has a new url. It has moved from Glasgow to UCL.